This weekend saw Gordy is a DJ return to one of it’s favourite venues and we knew our next blog would be a Rutherglen Town Hall Wedding Review. Constructed in the mid-19th century and located on Rutherglen Main Street, this venue was refurbished in 2005. It offers a blend of the old and new by combining the Grand Hall and Mezzanine Bar to create the perfect wedding venue. 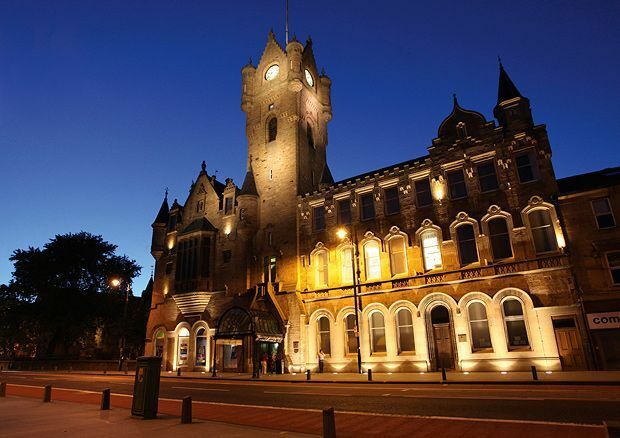 Whether you are looking for a small intimate wedding or a larger affair, wedding couples will find the perfect space within Rutherglen Town Hall with no minimum numbers required. The Grand Hall can hold up to 150 for the wedding meal and up to 200 for evening wedding reception. The Mezzanine Bar is the ideal room for wedding meals up to 50 guests or less. Liz and her team are absolutely fantastic – nothing is too much trouble for them. All questions are answered swiftly and they look after their wedding suppliers just as much as the happy couple! Providing us with refreshments, checking we have everything we need and explaining the timings of the day makes our job so much easier. Access to the venue is relatively easy. Parking at the back door, with instant access to the lift makes things simple. On exit from the lift, the stage area is only a few steps away. Again, staff can’t be more helpful and Gordy is a DJ appreciates this greatly. Our wedding couple, Mr and Mr Connelly-Traynor opted to include mood lighting which as you can see from the above photograph, enhanced the gothic appearance of the venue. On visiting the reception room for the first time that evening, the happy couple were emotional (in a good way!) when they saw the impressive lighting, which created the wow factor! With plenty of room for dancing, this venue allows everyone to enjoy the party without feeling cramped. Rutherglen Town Hall is definitely worth viewing if you have still to consider a wedding venue. Magnificent architecture, superb staff and a unique reception room makes this overall a fabulous place! For more information about Gordy is a DJ’s award winning service, please contact us here.